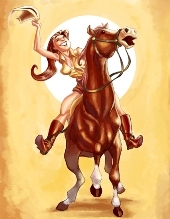 Any Cowgirl knows……..its not the size of your horse, its how you ride it. 3 barrels 2 hearts 1 dream! but that’s just for barrel racing. Never squat with your spurs on. Boots, chaps and cowboy hats…nothing else matters. A good horse is never a bad colour. A girl, a horse, and a dog, never tire of each other’s company. Save a real cowboy, ride a real horse! a car, plain, and train can take us a 100 miles but a horse can take you somewhere out of this world.